Editor’s Note: Very Rev. 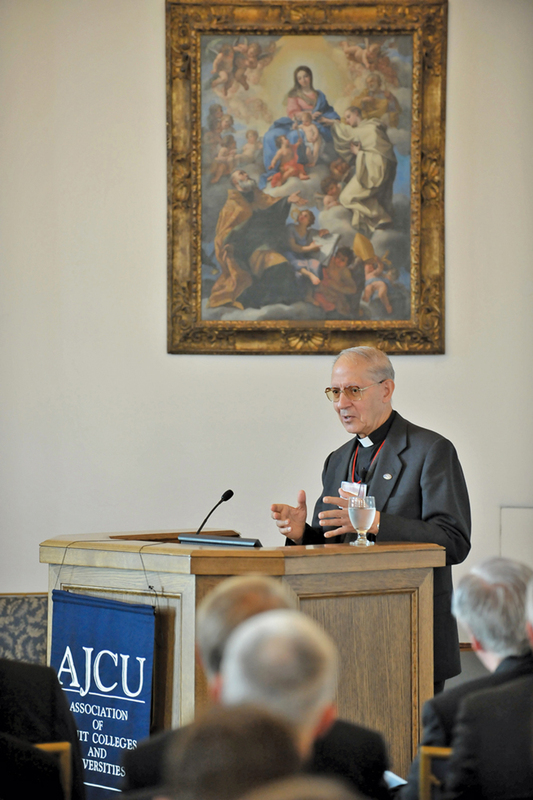 Adolfo Nicolás, S.J., superior general of the Society of Jesus, met in Chicago on Oct. 12 with the board chairs and presidents of the 28 Jesuit colleges and universities in the United States. Also present at this unprecedented meeting were the superiors of the nine regional provinces of the Society of Jesus in the United States and other Jesuit officials. All the board chairs are laymen and laywomen, a common arrangement in the United States but rare in the rest of the Catholic world. America’s editors have collaborated with the Association of Jesuit Colleges and Universities to make this official, edited text available to our readers and others interested in Jesuit Catholic higher education. Some of Father General’s spontaneous asides appear in sidebars. My goal today is to present some overall thoughts about exercising spiritual and heroic leadership, some more specific thoughts about what a leader does at a Jesuit Catholic college or university in the United States at this point in history, and a consideration of the prerequisites for good decision-making. I will close with some particular questions for you to study as the decision-makers at the schools entrusted to you in your capacities as the leaders of Jesuit higher education in the United States. Spiritual leadership is a crucial dimension of the service that everyone gathered here today is called to exercise. This kind of leadership is not relegated to a special clerical or religious caste. There can be no doubt that leaders at professedly religious institutions like the colleges and universities you represent and lead must exercise spiritual leadership. First, all leaders of a Jesuit institution must reinforce and motivate their members and communities in the values and attitudes that are based in the sacred Scriptures of the Judeo-Christian tradition. Leadership at a Jesuit institution is about evangelization—for Jesuit institutions exist only because of the particular, scripturally based faith perspective that led to their establishment. Thus, the primary function of leadership is the reinforcement and animation of these perennially relevant attitudes and values: God loves the world, God dwells among us, God empowers us to make the world worthy of God’s children. Second, service is the basic concept of understanding authority. Pope Benedict’s resignation from the papacy has been the last and perhaps greatest lesson of the great teacher Josef Ratzinger, showing how the pope is in service of the church and not the other way around. The pope is not the most important person in the church. The most important person is Christ. So when Benedict saw he could no longer serve the church as he thought he should, he stepped aside, because the church, which is the body of Christ, is much more important than a pope. The lesson for us is that the authority exercised at a Jesuit, Catholic institution is always a form of service. And third, in the understanding of St. Ignatius, the principal function of a leader is to help the members of a community grow to become the living presence of God in the world. In the Ignatian concept of service, growth leads to transformation. If there is no transformation, then the school or the parish is not Jesuit. The ultimate objective is an individual’s transformation and, through individuals, the transformation of society. There are no instantaneous transformations, even though sometimes we are attracted to the idea of sudden, painless, effortless change. We like to imagine that St. Paul was struck from his horse and immediately became an effective apostle. But in the Acts of the Apostles, there is no horse; and after his conversion Paul went to Arabia for three years of intense prayer and study before he eventually journeyed to Jerusalem to test if what he understood was in line with the apostles. Transformation is a long process that involves much hard work. Let me now say a few things about how leaders like those I have just described—that is, leaders like you—engage in decision-making. St. Ignatius organized a process so that decisions would be less subject to human whim and impulse; unhampered by human bias, partisanship and prejudice; more open to freedom; deeply rooted in the experience of dying to what is passing and ephemeral so as to enjoy greater life. Thus, seeking God’s will is a process of asking ourselves what we really want, what is most important to us and what we desire most fundamentally, the pearl of great price hidden in the field that we will give everything to possess. Leaders who make good decisions can do so only when four prerequisites are present: a community of shared values, freedom, generosity and selflessness. The first prerequisite is a community committed to shared values. God’s will is best found in a group of people, not inside someone’s head or individual consciousness. Whether it is the church, a religious congregation or an apostolic work; whether it is a board of directors, a faculty or a group of students, the community is a crucial ingredient. You need to have community to be able to discern. Decision-makers need to be surrounded by people who provide input, who give advice, who suggest alternatives. A single person cannot decide what is most important for an institution. A community of committed colleagues who work together is necessary. The people in this community need not all think alike, because whenever everyone easily agrees, probably not everyone is thinking. But the members of the community need to have the same fundamental values, because if they don’t have the same values, they cannot arrive at the same objectives. You are all blessed to share the terms American, Catholic, Jesuit and institution of higher learning, but many different understandings surround these key terms. Being an American, for example, is based on the pledge to embrace the abstract ideals of liberty, equality and popular sovereignty, but liberty and equality frequently conflict with each other. And both can be threatened by a popular majority. Not everything that wraps itself in an American flag is worthy of the great ideals of your nation, so having discussions about what it means to be an American institution, especially in these days of globalization, is important for you. Catholic is another important word that is used in all kinds of different ways. The Internet is full of examples of conflicting understandings of what it means to be Catholic. Jesuit is another word that gets all kinds of interpretations. Phrases like “men and women for and with others,” cura personalis and ”finding God in all things” say something about what it means to be a Jesuit school, but words like spiritual indifference and detachment need to be part of the real understanding of what it means to be Jesuit educated. We don’t want to settle for a shallow understanding of what it means to be a Catholic and Jesuit institution in the United States. Finally, selflessness is necessary, a humble altruism that surrenders my own preferences to a greater good. For Ignatius, “the greatest need” always stands out. Surrendering what I personally think of as important to a bigger, more important transcendental value puts everything into proper perspective; it also makes possible all the smaller and less important choices that go into accomplishing a great goal. I want to emphasize that you are the heroic and spiritual leaders of Jesuit higher education in the United States, who are rightly placed to make important decisions. In the past there might have been a mystique that some of my predecessors had all the answers so that all they had to do was write a letter to a provincial who would write a letter to a president, who would tell everyone what was going to happen because there was an attitude that “Father knows best.” I don’t think that was ever actually true, even if some people might have acted as though it were. In any case, my purpose today is to make sure everyone knows that the future of Jesuit higher education in the United States is in the hands of boards of directors, and that I am very happy that is the case because I know, looking at you, that it is in good hands indeed. Through what I say today, I want to initiate a long-term discussion about a topic we do not often articulate. The 28 colleges and universities you represent have been in a close relationship with the Society of Jesus and its members since your country began. Perhaps without much realization on anyone’s part, those defining relationships have changed a great deal over time, especially in the years that followed the Second World War and the Second Vatican Council. Nearly all the institutions have grown substantially in size, complexity and wealth; budgetary pressures and the need for increased fundraising have become enormous; models of administration and leadership have changed dramatically; extracurricular and co-curricular programs have grown in importance. At the same time, the roles of Jesuit superior and university president have been separated. Today one does not have to be a Jesuit or a priest or even a Catholic to be the president of a Jesuit college or university in the United States. In fact, universities were identified early as places where lay professionals could increasingly assume leadership positions and become their guardians in a number of important ways, for instance as trustees. Indeed, the church and the Society of Jesus have recognized and welcomed—perhaps rather begrudgingly at first but now with confidence and great enthusiasm—the role of the laity in many dimensions that were formerly reserved to clerics or vowed religious. While extraordinarily fine things have happened in Jesuit higher education in the past 60 years, other changes have taken place that we have ignored or avoided discussing. In 1973 there were about 212 million people in the United States; today there are about 316 million, but the number of Jesuit colleges and universities has remained the same. During those same 40 years, the number of Jesuits in the United States has declined from 6,616 to 2,547. Since the supply of Jesuits is increasingly limited while the demand for more Jesuits seems to always expand, some changes are in order. What might this demographic situation mean for the service we want to provide for those who suffer disadvantages like those that led to the establishment of the first Jesuit schools in the United States? What might it mean for the warm and familial relationship that has existed between Jesuits and the Jesuit colleges and universities for over two centuries? We must ask ourselves how much longer the two trend lines can go in opposite directions before the traditional relationship between the Society of Jesus and A.J.C.U. institutions—a relationship that has always been based in personal, one-on-one, direct human contact—is stretched so thin that it becomes impersonal and meaningless. At this point Father Nicolás challenged the presidents and board chairs, along with the Jesuit provincials of the United States, to decide how they can more effectively lead their institutions in the future. He asked, “What selfless actions—based in the freedom, generosity and shared values as a community committed to Jesuit higher education—might God be asking you to lead at your particular institution?” He then asked the same question about how all 28 A.J.C.U. institutions could network and collaborate with each other. I have no doubt that you are the right group to consider these questions. You have the talents and temperament, the head and heart, to do what needs to be done. I ask that you consider these questions not just as individuals, but also as members of an important network of schools. I ask these questions knowing that it is the Lord who will show us the way if we are bold enough to ask for direction, if we are humble enough to listen to our most fundamental desires for serving the good of his people, if we are committed to being so generous that we do not count the cost or heed the wounds or seek any reward other than knowing we have given all we can to him. As I come to the end of what I want to say this morning, I would like to ask your help in recruiting Jesuits. I would appreciate the help of all the board chairs in the room. Could you please have a serious conversation sometime with your provincial about the kinds of resources your institution or company uses to recruit a new generation of employees? Could you talk to your president about what more could be done on campus to recruit future Jesuits? Could you please make some suggestions to the local Jesuit community about what they might do to make themselves better known and recognized as a viable and vital option for young men today? Jesuits may not always listen to superiors, but I think they will listen carefully if you call them aside! Finally, let me return to where I began, thanking you again for all you do. Jesuit Catholic institutions of higher education would not be the important apostolic instruments they have become without you. They will not flourish in the future without your commitment and hard work. Thank you for being part of this important apostolate of the Society of Jesus. I would respectfully suggest that American Jesuit colleges and universities should question the current policy of being "conformed to the world." By that conformity I mean following the model of secular corporate universities. To begin with, the practice of having students take out massive loans to pay for an undergraduate education should be eliminated. The Very Reverend Adolfo Nicolas S.J. may have made made his presentation on Catholic higher education at Jesuit universities and colleges too late, but better late than never. "The Canon Law petition of more than 2,000 Catholics represented by Academy Award winner William Peter Blatty, whose best-selling book and blockbuster film The Exorcist were situated at his alma mater Georgetown University, has now been submitted to the Supreme Pontiff with the guidance and green light of the Archdiocese of Washington. The “Petition” asks the Catholic Church to require that Georgetown implement Ex corde Ecclesiae, a papal constitution governing Catholic colleges, and, only as a last possible measure, the removal or suspension of top-ranked Georgetown’s right to call itself Catholic and Jesuit in any of its representations. As head of the Argentine bishops’ conference and as chancellor of the Pontifical Catholic University of Argentina, Cardinal Bergoglio, now Pope Francis, successfully implemented Ex corde Ecclesiae, and he also approved of Pope Benedict’s 2012 decree removing consent from the University of Peru to call itself “Catholic”. http://www.gupetition.org/ Closer to home a close Catholic friend's highly quallified child applied to Georgetown and was interviewed by a graduate who failed to note the 12 years of Catholic education but did note the last name was Jewish, the father was Jewish. The interviewer went on to extoll the Jewish presence at Georgetown, the number of Rabbis, Jewish students and named well known Jewish graduates. Georgetown was scratched from the list of suitable universities. This article also appeared in print, under the headline "A Call for Spiritual Leaders," in the November 11, 2013 issue.